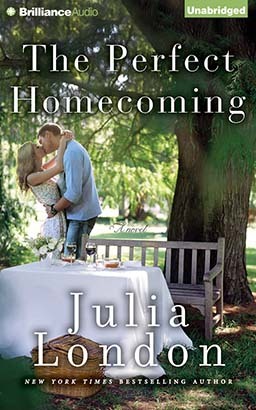 New York Times and USA Today bestselling author Julia London delivers another stand-alone, heartwarming love story in her Pine River series. Emma Tyler’s cool exterior and penchant for sarcasm keep most people from getting too close…and an unusual compulsion drives her to steal from the few men who do. When her trophy-collecting habit goes too far, she quits her ritzy event-planning job in Los Angeles and runs away to Pine River, hiding with her estranged half-sisters at Homecoming Ranch and caring for Leo Kendrick, her ailing friend. Thrillseekers Anonymous founder Cooper Jessup has his hands full with work and his brother’s looming prison release date. But when a client asks him to track down Emma Tyler to retrieve a stolen memento, Cooper can’t turn down the money…or the chance to see the beautiful Emma again. When Cooper comes to collect the item, Emma refuses to admit the horrible truth. This handsome man may see right through her steely veneer, but can he get close enough to show her how love and honesty can heal a troubled heart?